This example shows the basic workflow of tuning feedback loops with the looptune command. looptune is similar to systune and meant to facilitate loop shaping design by automatically generating the tuning requirements. 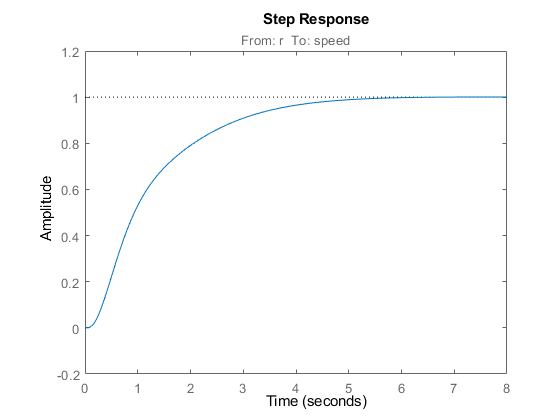 This example uses a simple engine speed control application as illustration. The control system consists of a single PID loop and the PID controller gains must be tuned to adequately respond to step changes in the desired speed. Specifically, we want the response to settle in less than 5 seconds with little or no overshoot. 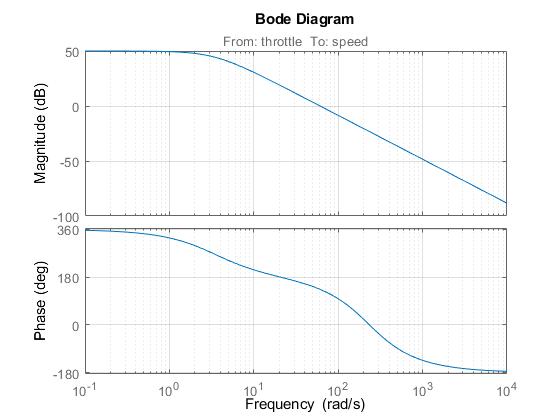 We use the following fourth-order model of the engine dynamics. We need to tune the four PID gains to achieve the desired performance. Use the tunablePID class to parameterize the PID controller. Type "pid(PID0)" to see the current value and "get(PID0)" to see all properties. 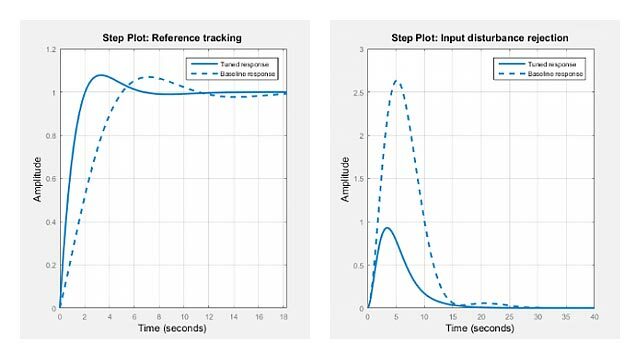 looptune tunes the generic SISO or MIMO feedback loop of Figure 2. 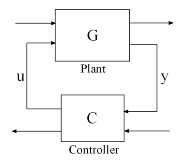 This feedback loop models the interaction between the plant and the controller. Note that this is a positive feedback interconnection. For the speed control loop, the plant G is the engine model and the controller C consists of the PID and the prefilter F.
To use looptune, create models for G and C in Figure 3. Assign names to the inputs and outputs of each model to specify the feedback paths between plant and controller. Note that the controller C has two inputs: the speed reference "r" and the speed measurement "speed". Here C0 is a generalized state-space model (genss) that depends on the tunable PID block PID0. You can now use looptune to tune the PID gains subject to a simple control bandwidth requirement. 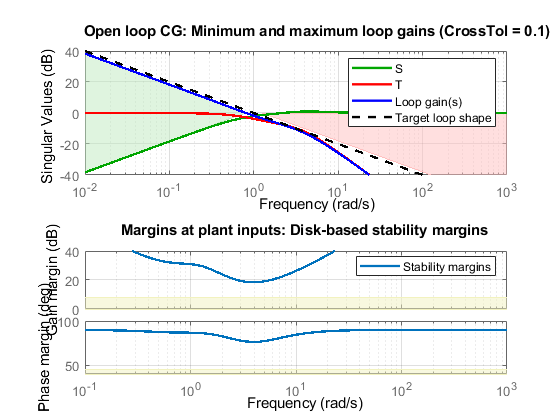 To achieve the 5-second settling time, the gain crossover frequency of the open-loop response should be approximately 1 rad/s. Given this basic requirement, looptune automatically shapes the open-loop response to provide integral action, high-frequency roll-off, and adequate stability margins. Note that you could specify additional requirements to further constrain the design, see "Decoupling Controller for a Distillation Column" for an example. The final value is less than 1, indicating that the desired bandwidth was achieved with adequate roll-off and stability margins. looptune returns the tuned controller C. Use getBlockValue to retrieve the tuned value of the PID block. Use loopview to validate the design and visualize the loop shaping requirements implicitly enforced by looptune. Next plot the closed-loop response to a step command in engine speed. The tuned response satisfies our requirements.